Allston doesn’t have the best reputation among Boston University students or locals. Many students prefer to limit their time in Allston to late nights, “crawling” through frat houses and losing winter coats and student IDs in the neighborhood’s streets — like Cinderella lost her slipper at the ball. We don’t want to see Allston in the light of day, and that says something about the neighborhood. Many off-campus students call Allston home, but when we associate the area directly to the west of our school with grit and rats, would a facelift be a bad thing? Property developers are using Allston’s reputation as ammunition for making major changes to the neighborhood that’s long been known as a “student ghetto.” If the Boston Planning and Development Agency approves development plans, 334 residential units and over 22,000 square feet of office space will be built across six buildings on and around Cambridge Street. Apartments and condominium units could also be added in a three-building complex in another area of Cambridge Street, and a residential development project down the street would add 1,050 more housing units. Development might make these neighborhoods look nicer. It might make them safer for students who don’t like being threatened at gunpoint or mugged while walking home at night. If you read campus crime logs in The Daily Free Press, you’ve probably read about more than a few of these instances. But it’s important to remember that BU students aren’t the only people living in Allston. Allston was a neighborhood before BU made its home nearby — and before we students infiltrated the community, doing our part to drive rents up and increase the cost of living for people who have lived in the area for generations. It’s true that nearly 90 percent of Allston’s residents are renters, according to the Boston Redevelopment Authority (now known as The Boston Planning and Development Agency), but not all of those are students. Families live there too, and if they’re renting, it’s because it’s what their budget allows. The people who don’t have means to own houses should be able to stay in the area, and developing more for the sake of boosting ownership over renting will block those people out. As it stands, rents are still relatively low in Allston compared to many of Boston’s other neighborhoods. These new projects, in improving Allston’s overall facade, are expected to make the neighborhood a more desirable option for Bostonians and students looking for off-campus housing. State Rep. Kevin Honan said Allston has been “discovered,” according to Boston.com — a word we know is synonymous with the onset of gentrification. But how many of these new units will be affordable? 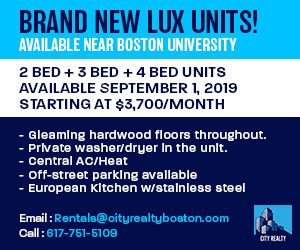 How many of these units will go toward Allston residents who need affordable housing or BU students looking for cheap options, and how many will go toward Airbnb and short-term rental owners who are largely responsible for the city’s housing crisis? The City currently requires that 13 percent of new large residential developments in the Allston-Brighton area are affordable, according to a petition by the Brighton Allston Community Coalition. This isn’t enough, considering the impact new development could have. Boston is one of the least financially accessible cities — we have the fourth highest rents in the country, according to a study by Zumper. Only a few neighborhoods — one of which is Allston — make living here an option for people without six-figure salaries. The availability of housing units in these neighborhoods are essentially the reason why Boston isn’t entirely a city for the upper class. Boston renters pay an average of $2,340 per month for a one-bedroom apartment, according to Zumper’s study. It costs an average of $1,850 per month to rent in Allston, which is definitely on the cheaper end compared to Back Bay’s $2,760 or the South Boston Waterfront’s $3,100. There’s a stereotype in Allston that college students are duped by landlords who rent us out bad apartments, and we don’t know any better. But really, a lot of us have no option but to live close to the school, and we need something affordable. If students are pushed out of the area by raising rents, that’s only going to contribute to a greater student strain on housing in other areas. The student population will simply migrate to another area. It’s hard to imagine what things will be like in a few years if the landscape is entirely reconstructed. Allston being, well, Allston, is such a big part of the culture of our community. These developments won’t add to the culture of the neighborhood. Half of these units will likely be bought out by short-term renters who will jack up prices beyond what any local can afford, and the other half will sit empty, but in the end, these projects are useless to build upon the neighborhood’s personality.